We've had a bit of an uptick in spam attempts recently, so I have implemented Google's ReCaptcha for registration and contact forms as a precaution. Hopefully this won't negatively impact anythin, but let me know if you have any difficulties. IRS Refund = Loan payoff = FUV! Now that I've paid off my last outstanding loan (Mortgage does not count.) I can start saving for the down payment & shipping required when I finally get notified it's my turn to order. (#2356) Since the build deposit on the Evergreen is approximately 25% of the purchase price, I'm making a big assumption that 25% will be consistent with the basic + tailbox & battery options I will order. Arcimoto announced a direct sale of $3.4 million in stock yesterday. 800,000 shares at $4.25 each. I look forward to the day that they no longer need to dilute their stock to remain afloat, but hey, they have funding to crank out those Evergreens, and they're expected to close it before the annual report, so maybe we'll get a more detailed investor call than the last one. In case anyone is interested, Dale (who started this website) has started a new Arcimoto Facebook group. It was time; the old one lost its admin and has been slowly dying. 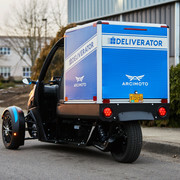 There's a new page on the Arcimoto site detailing the Deliverator and it looks like they've actually built one! Check it out! So... Mark Wahlberg got to try out an Arcimoto today. Check it out. The custom shop page is live and has a lot more details on getting a custom design on an FUV! There's no way I can spring for an extra $500, but dang I wish I did. I have several ideas. Hi folks - my reservation is just about 3 years old at this point. It was a speculative thing, relatively low risk, and I’m excited to see that the Arcimoto team is starting retail sales. Hope that the batteries perform better than my Nissan Leaf’s in the desert heat.